As a resort professional, you need the latest technology. You need to be able to reach your guests no matter where they are, efficiently and professionally. 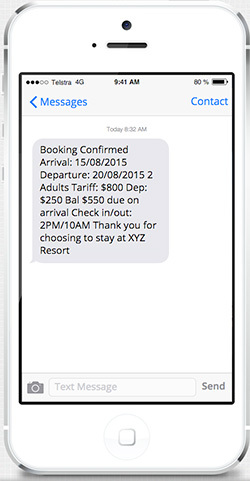 With Ezy SMS you can respond to enquiries, confirm bookings, implement effective marketing campaigns, and much more all from one program. Prices start from 9c per SMS ex GST. SMS goes directly to your target audience and can be personalised including your guest's name, booking dates and account information.